Dear 8th Wonder, as a contributor to the anthology, will I have the chance to purchase books at a discount to give away, resell, make origami, or read to my cat? Great question, thanks for asking. The short answer is: Yes, of course. The slightly longer short answer is: Once the submission period is over and we have a complete list of creators/participants, we’ll send out an introductory/welcome email to everyone, including that information. At the moment it looks like it will be at about the same rate we’ll be offering to distributors. There’s still plenty of time left to submit your pitch for our 2013 anthology, but to look at it another way: THERE’S ONLY THREE WEEKS LEFT TO SUBMIT YOUR PITCH! So get your thoughts together, make sure you include all the relevant details we need, and send it in! You could be the breakout of our book! 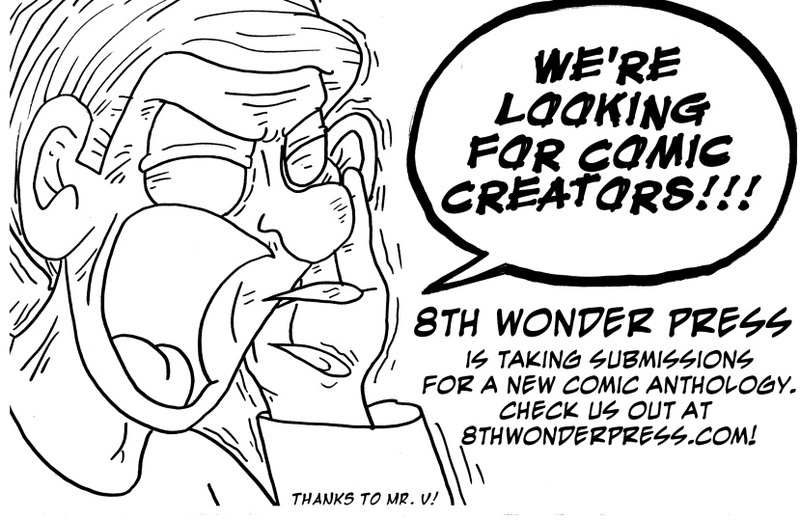 8th Wonder Press has just confirmed our first convention of 2013, where we will be appearing in the mile high city at Denver Comic Con! We’ll announce more as we get closer to summer, so stay tuned, and be sure to look for us in Denver. Submissions are starting to come in, and they’re looking great! Our latest addition is David Siddall, whose contribution “Shred” comes to us from all the way over in the UK. If you’d like to contribute here’s still plenty of time to send in your proposals! Sure, it doesn’t feel like the 2013 convention season is right around the corner, but if you’re trying to get a book out already it’s time to get cracking! Stay tuned for future updates, but we have a good one we can announce right of the bat: we’re now accepting submissions for our 2013 anthology! It will be out in time for the summer cons and we’re looking for proposals now. Check out our submission page to find out about getting published in our first (of what will hopefully be MANY) anthologies.